Wholesale bleach safe towels used in hair salons, nail salons or any business looking for towels which can be washed in bleach. Standard size of 16x26 extra soft and high end deluxe quality. Does your business need a fresh new set of hand towels with an added aesthetic? If so, then our bleach-resistant hand towels in burgundy are just the fit for you! 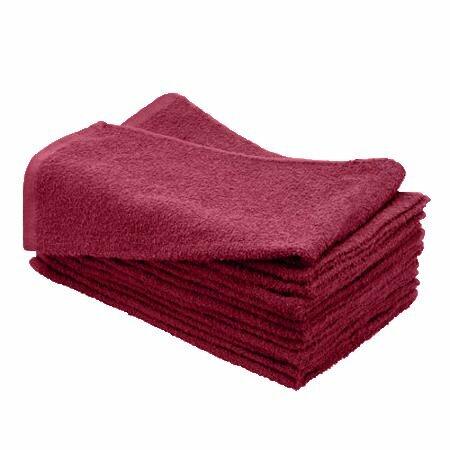 Our burgundy hand towels are crafted with 100% cotton and are fit to perform all of your drying needs with the luxurious softness and stylish flair your company desires. Soft to the Touch: Cotton is a sensitive-skin approved product. Your employees, guests and even you will enjoy picking up our soft hand towels whenever necessary. Don't settle for abrasive materials when you can enjoy the plush feel of cotton instead! Stain Resistance: Messes are inevitable — especially in salons, the car industry and kitchens. Whether you own a carwash or a salon, you recognize the importance of a material that retains its appeal even after mopping up messes and spills. Cotton repels stains and washes up easily with a bit of detergent and bleach for added convenience. Resistance to wear: Don't be fooled by cotton's soft and plush exterior. Cotton is a sturdy and robust fabric that can withstand constant use without fraying, tearing or ripping. As a business owner, you know how valuable it is to invest in a product that lasts. Since they are a cleaning accessory, towels receive countless stains and spots throughout the day. Fortunately, our bleach-resistant towels are simple to clean. Just pop them in the washing machine and add your bleach alternative — actual bleach if washing white towels — in with your load to guarantee a clean and vibrant towel your guests will admire. Their deep burgundy color also provides a stylish addition to any preexisting color scheme or décor. Bleach-resistant towels also work well in any apartment or home. You'll want to stock up our deep-hued bleach-resistant towels at Towel Super Center to add a pop of color to your home. These hand towels are versatile enough to drape anywhere in your home, from the kitchen to the bathroom. When you have guests over, they'll admire your sense of style and taste whenever they reach for one of your beautiful hand towels. At Towel Super Center, our number one priority is to provide customers with the products their home and business can invest in with guaranteed quality and satisfaction assurance. Whether you're a salon and spa owner looking for a bleach-resistant towel or a homeowner who needs a stylish towel for the kitchen and bathroom, Towel Super Center has just the towel for every one of our shoppers. At Towel Super Center, we offer more than just ordinary hand and bath towels. Browse our varied selection of linens, sheets and towels to fulfill your order with optimal satisfaction. Place your order online today for the drying accessories you deserve.